Jōkyō calendar published in 1729. Exhibit in the National Museum of Nature and Science, Tokyo, Japan. 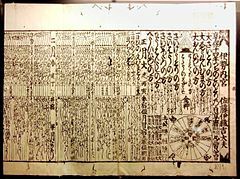 Japanese calendar types have included several of official and unofficial systems. At present, Japan uses the Gregorian calendar and also the Japanese era name system. The Japanese Imperial year (皇紀, kōki) or "National calendar year" based on the legendary founding of Japan by Emperor Jimmu in 660 BC. Since the Meiji period, Japan has used the Western Common Era (Anno Domini) (西暦, seireki) system. In Japan today, the old Chinese calendar is rarely used. The system of counting years from the reign of Emperor Jimmu has been abandoned. The Japanese calendar has yearly holidays and traditional events. Some of these preserve ancient customs. The names and dates of some of Japan's national holidays have changed over time. ↑ 10.00 10.01 10.02 10.03 10.04 10.05 10.06 10.07 10.08 10.09 10.10 10.11 Brown, Ju. (2006). China, Japan, Korea: Culture and Customs, p. 68. 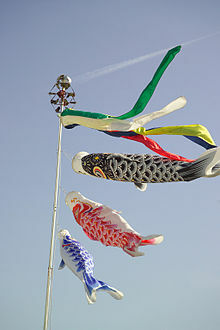 ↑ 11.0 11.1 11.2 InfoMapJAPAN, "Japanese National Holidays/Traditional Events"; retreieved 2012-2-21. ↑ 12.0 12.1 12.2 "Japan," Catholic Encyclopedia (2009); retrieved 2012-2-21. This page was last changed on 31 August 2017, at 04:30.